Wooooow, I am really sucking at this whole pregnancy update thing, but I mean really, who's surprised? 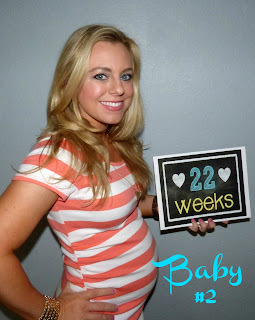 But here we are with a 22 week update.....when I will be 26 weeks in two days. Shameful. Anyhow, on to the update! Is the size of a spaghetti squash...around 11 inches and a full pound. His senses are really developing this week, such as taste buds forming and he's developing a sensation of touch. He may even be able to sense the light from a flashlight if I shine it on my belly, but I've honestly never tested this with either baby. Right at 10 pounds, according to the scales at home. I'm just under where I was last time, but I also started out two pounds heavier this time around. Oh ya know, same old thang. Sugar. Pizza. Bacon cheeseburgers. Cereal. Thai Tea. Basically anything super unhealthy, give it to me. NOW. My aversions change from day to day, but sometimes certain things just sound so awful I can't even deal with the idea of whatever it may be. I went through the same thing right around 23 weeks with this guy that I did with G around 22 weeks where he was way more quiet in there than normal. I freaked out last time, and freaked out this time again. But after reassuring myself with many Google searches, I realized that this is totally normal for this point in pregnancy (duh, since I dealt with the exact same thing around the exact same time last time). Daddy has confessed that he's a little worried that he won't feel the same way about this little guy that he does about G, so his excitement level isn't quite as high as it was with Grayson, probably just because of that fear. But he has started talking about how he can't wait to have another baby around, how it will be fun to see G with the baby, and whatnot. I think the second time around isn't quite as OMG this is awesome for dad since we've done it all before. 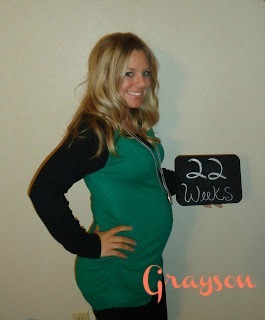 But I know once baby boy shows up Daddy will be head over heels, just like he is for Grayson. This kid is wiiiiild, let me tell you. Since he started moving he's been flipping and flopping in there nonstop, which is what made the stillness around week 23 so nerve-racking. I've said it a million times, feeling a baby move inside of you has to be the number one coolest experience a person could have. Other than that, nothing too exciting went on around this time. Time is just flying by, and I'm well-aware that before we know it he will be here!